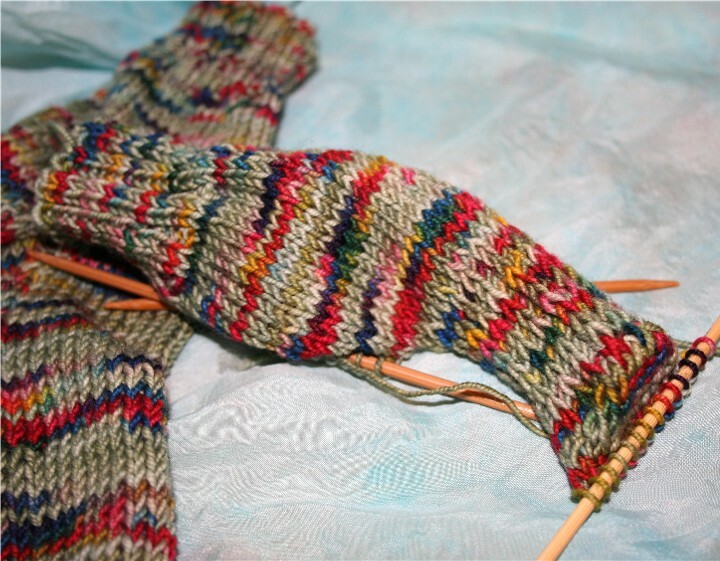 I love the process of turning a heel. It's still slightly mystical to me, the process by which the three dimensional heel cup magically appears. I know it's all in the math, but I prefer to be seduced by the mystery and I love the way it looks when it appears. The there is the frill seeker scarf. I'm not as sure about it as I was just from looking at the picture. It seems sturdier, sort of more along the line of overstuffed Edwardian matrons than in the nature of the frilly, sort of silly-but-elegant fusion of cashmere and wool mesh that I had envisioned. I have decided to give the pattern a chance, but if it doesn't work out, I'm going to shamelessly frog and create my own pattern, sort of less compacted frills and more in keeping with my original vision. I will now have to force myself not to spend endless hours learning new knitting techniques when I am supposed to be, ahem, working. That is five kilograms of blue face leicester sock yarn. I agonized over this yarn. I researched. I fondled endless samples. I was obsessed. My favorite knitter pals, some of the other moms from my Sept98 parentsplace pregnancy board, decided we wanted to do a sock-a-long. 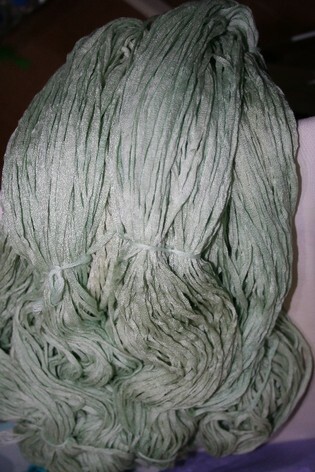 I think this is going to be the perfect yarn -- an incredibly soft, lofty, but washable BFL. Oh the joy of dyeing this fluff! We haven't decided on colors yet, but I cannot wait to get started! 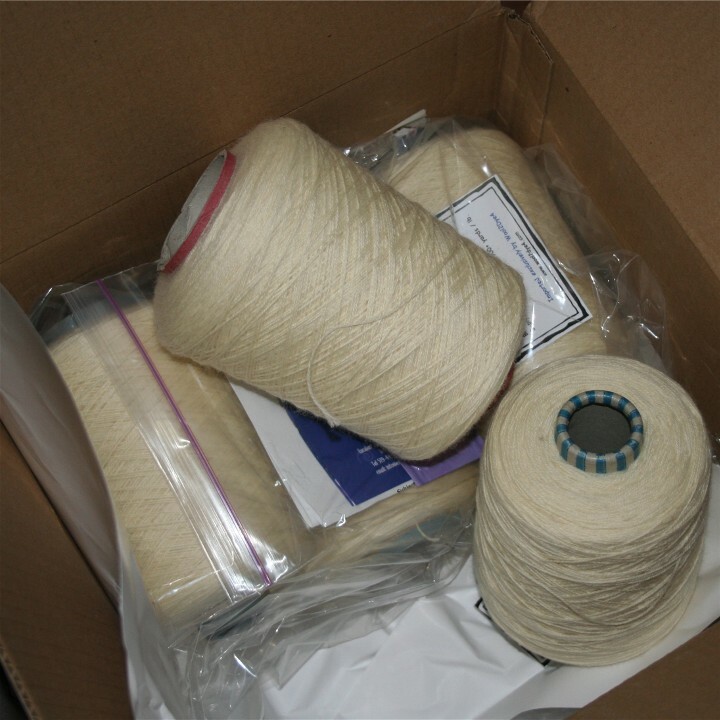 Because it came in kilos, instead of skeins as I originally anticipated, I was cruelly forced to purchase a skein winder, since I'm a bit suspicious of my swift's skein winding abilities, and winding skeins around the lid of my hope chest, which I do for self-striping yarns, is unbelievably tedious. My dear friend Vicki turned me onto this awesome skein winder call the Mama Bear and I am now eagerly awaiting its arrival. The man who makes the winders is really nice. I can't wait to start winding skeins. In the meantime, I am making myself happy with my new bamboo ribbon yarn. I've dyed it a pale celadon, one of my favorite colors on wool, and am trying to decide on a palette to paint it in a multi-colored dab effect. I am set on purple and maybe a really brilliant orange, but am still playing with the whole idea. As much as I would like to convince myself that this yarn is going to end up on my body, Ellie has been eyeing it, which probably means it's time for me to start looking for cute little girl patterns with ribbon yarn. Any ideas?